Full score, including SC code. A demo of the first part of the piece, using SuperCollider and Logic. ‘When the last trace of the rocket’s presence, a whitish haze, had been absorbed by the atmosphere, when the wandering sandy waves gradually began to cover up the naked rock of the ground, at the same time filling in the deserted digging spaces – only then, much later, did a dark cloud gather in the west. Hovering low above the ground it pushed closer, grew, encircled the landing area with a threatening arm. There it remained, motionless. ‘The Black Rain’ takes its title from the first chapter of Stanisław Lem’s 1967 science fiction novel ‘The Invincible’, in which a mighty spaceship and her crew are overcome by a race of microscopic mechanical flies, individually insignificant, but capable of joining together into a vast quasi-intelligent ‘cloud’: surely one of the first fictional works to speculate on the possibilities of nanotechnology, calling to mind such devices as the nanostats which inhabit Neal Stephenson’s 1995 novel ‘The Diamond Age’, and the EDust, or Everything Dust, in Iain M. Banks 2000 ‘Look to Windward’. 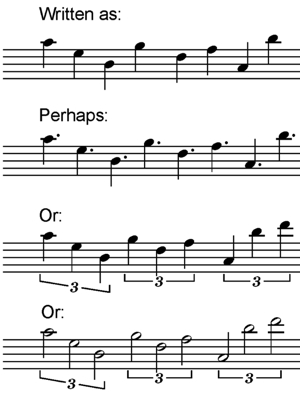 In terms of musical devices, ‘The Black Rain’ represents, through self-quotation, a critique of a group earlier works of mine (‘smir’, ‘4thought’, ‘5lipside’ etc), all of which float angular melodies across polymetric rhythmic frameworks, usually according to some quartal scheme, and usually, it would seem, in roughly the same key. Written for and first performed by the Scottish Ensemble, directed by Jonathan Morton, Plug festival 25/4/12.